This is to give you an update on our recent trip in October. Six of us, including two trustees, went for a couple of weeks and had an interesting and stimulating time. We were delighted to see the progress that has been made in the libraries and the schools since our last visit. The trustees had meetings with all the staff, management committees, headteachers, students and their parents and then went on to meet key people at the bank, the accountant firm and the NGO office to sort out all regulatory affairs. Our group included various friends and supporters of Akili, including, Cheryl Moskowitz, a poet and writer, and Steve Grocott, a musician. Both have extensive experience of working with schools in the UK and were able to use this to plan and run workshops in our schools. They will write about their experiences in our next newsletter. We have also set up links between two primary schools here in London and our schools. Laycock Primary School in Islington sent two scrapbooks about the lives of children in Year 4 and Martyn Coles and Joan Lindeman worked with the children of a similar age in Dabaso to prepare a book which was shared with the children in London. This is an exciting initiative and one that we would like to develop further. 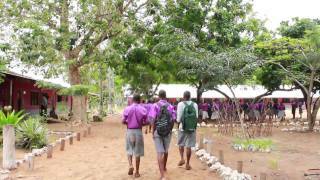 The school is doing well and the new large makuti shelter is providing an exciting new learning space. It would be nice to provide chairs for this – plastic chairs cost about £5 each and we would like to buy 30 (any volunteers?). Our librarian Josephine has moved with her young family to Nairobi where her husband works. We were delighted to appoint Fred Kittu as our new librarian with the unanimous support of the Library Management Team. Fred has covered for Josephine in the past and has got a good knowledge of our work and knows the school well. Our former IT trainer in Dabaso, Cornelius Kahindi, was at the same time confirmed as the Assistant Librarian / IT tutor which is our new staffing structure – as it brings ICT skills into the team. Fred and Cornelius make a creative pair and have an excellent working relationship. We were amused to see that French skipping is the latest craze in the school and making aeroplances. The school is being renovated with a new roof throughout so is something of a building site at the moment, though the staff and students are showing great resilience. The library wiring was in a state of crisis so we had to fund some emergency repairs but otherwise the library is running well and looks very inviting. The school did a performance for us including songs, drumming, dance and gymnastics – great to see the children’s enthusiasm. The school received an unexpected donation of computers which have been located into the library, throwing the library plans into disarray. A new laboratory / science block is currently under construction and after some discussion it was agreed to relocate the library into the former science building. This will be in February, when they will also advertise for a librarian to be paid for from school funds. The next shipment of books will be largely targeted at this school – as the headteacher, Dennis McKenzie, says: you can’t call yourself a historian if you only know about African history – and you can only do well in written exams if you read widely in English. We loved the new slogans over each classroom door. In all the libraries there were queues of children to borrow books and children working and studying outside school times and on Saturdays. The most popular books are the Kenyan books, books in Swahili and the children’s picture books from the UK. So it is essential that we are clear about what we ship and ensure that we maintain and develop the budget to buy books locally. We are currently working on a funding application to pay for revision guides for the bursary students. The computer training is going well and we were moved to observe an adult having his very first session with a computer and keyboard –so exciting for him and us. A Kenyan NGO, DOT Kenya, is using both of the libraries as a base for their training programmes for young adults in the area. One of the biggest changes that we planned and discussed on the trip is to give each library management committee more delegated responsibility. From January we want them to have an annual budget to cover running expenses and minor repairs. They are very keen on this idea and it will help to develop an increased sense of accountability. From January 2013, we will also be regularising staff pay to use the Kenyan PAYE systems. Once again Footballs for fun generously gave us footballs which we were able to present to each school after persuading the airlines to allow us to take huge bags. Our next newsletter will update you on the bursary students and give you an insight into their lives. Don’t forget the Blues evening on 16 March 2013… and thanks for your continued support and funding. Donations, either specifically targeted or for our general budget, are needed and gratefully received.